Energy medicine, energy therapy, energy healing, or spiritual healing are branches of alternative medicine based on a pseudo-scientific belief that healers can channel healing energy into a patient and effect positive results. This idea itself contains several methods: hands-on, hands-off, and distant (or absent) where the patient and healer are in different locations. All healing must start by getting to the emotional cause of the ailment, or the problem will reoccur or manifest in another part of the physical body. Once established, with forethought that the patient is ready to accept the energy you will channel to them, you are both ready to begin. 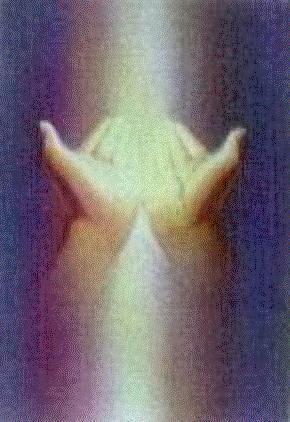 Healing, using the palms of the hands, is almost instinctual, and is becoming a growing technique, especially with Reiki, as an easy way for anyone to tap in and develop healing skills. When you begin, focus on the palms of your hands, relax, and slowly feel the energies filter through them. This may create a sensation of heat or tingling. Here's what's going on. You raise your frequency ... bring in higher balanced energy ... transmit it to the other person by touching them, or holding your hands near their body. Some people wash their hands before and after a healing session. Let's first determine which hand works best for you. Hold both hands out in front of you - palms up. Focus your attention on your left hand and experience the flow of energy. In truth, the left hand receives energy and the right hand sends it out. Focus on your right hand and see how strong the energy from that hand feels. One palm should feel stronger energy flow - hotter - more tingles. Now place your hands - palms facing each other - just in front of you. Keep them about 3 inches - 7.6 cm - apart. Move your hands slowly - back and forth. Feel the lines of energy between your palms. Now slowly move your palms further away from each other. See how far out you can go before you no longer feel the 'pull' of the energies. When the energies stop - move your palms back and forth slightly in opposite directions and you should continue to feel the energies. Now let's tap into that energy ... relax, breath deeply, and focus on your palms. For some people this happens immediately, for others it takes time to recognize the changes in frequency. The more you practice, the better and more powerful you become. Now allow the energy to come through you. You may feel the source of the energy if a spirit guide, another healer on the other side, angels, or you may come to understand that it is you ... that you have the power once you practice and learn to tap in. Take your time working with the energies until you are comfortable with them moving through your body, and how your body reacts to them - heat, cold, tingles, increased psychic abilities, etc. Find someone who needs healing. Be sure the person comfortable. Determine their emotional problems. Keep the conversation brief, this is not a therapy session, but you do need to know what's going on and what the physical problem in masking. The person will heal faster and more permanently if they are confident in your abilities. Assure the person that you will do nothing to hurt them in any way or aggrevate the situation. Place your hands within three inches from - or on the person. Pause and allow the energies to begin to flow through your body. This could take a few minutes. 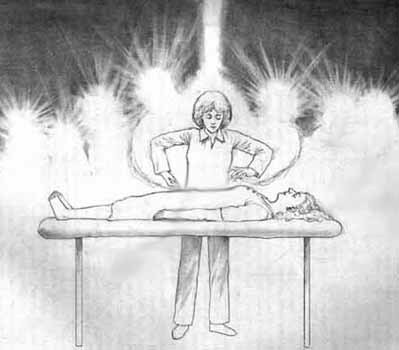 You can do an auric sweep of the body by move your hands slowly down the body starting with the top of the head. You are looking for changes in temperature levels which is an indication of improper flow of the energies in their subtle body. When you feel this change tell the person. They may respond with, "Oh yes, I have been having discomfort there." At the very least you are finding one or more problems. When you find the problem, place your hands near, or on that part of the body, focus your attention to it, and visualize the higher frequency energies coming through you into the other person. It will happen. Anyone can do it. There is no specific time frame for the healing. The amount of time you spend with the person is up to both of you. On occasion, someone you nay as if someone has energetically entered your body to do the healing. The other energy could come from your spirit guide or that of the person being healed, as we all have guides. It all takes practice. You can use the healing energies from your palms on pets, animals, plants, on your own body, anything with an auric field to accept the exchange of energy to create healing, balance and understanding.